Back in January 1948, the Commonwealth Arbitration Court officially agreed to a 40-hour, five-day working week in Australia. Along with it came the symbol ‘888’ – representing the supposedly daily ideal of 8 hours’ work, 8 hours’ recreation and 8 hours of sleep. Firstly, I can’t remember the last time I had 8 hours of sleep. An 8-hour work day is a huge rarity and 8 hours’ recreation… well… if laundry and groceries count then at least I’ve got that one nailed. But in ‘48 the Australian public were pushing for this agreement, they saw it as a real chance to get their hands on the holy grail: work-life balance. Truth be told, that grail has alluded us for the 70 years since and in fact, just like the real holy grail, I have strong doubts the thing even exists. 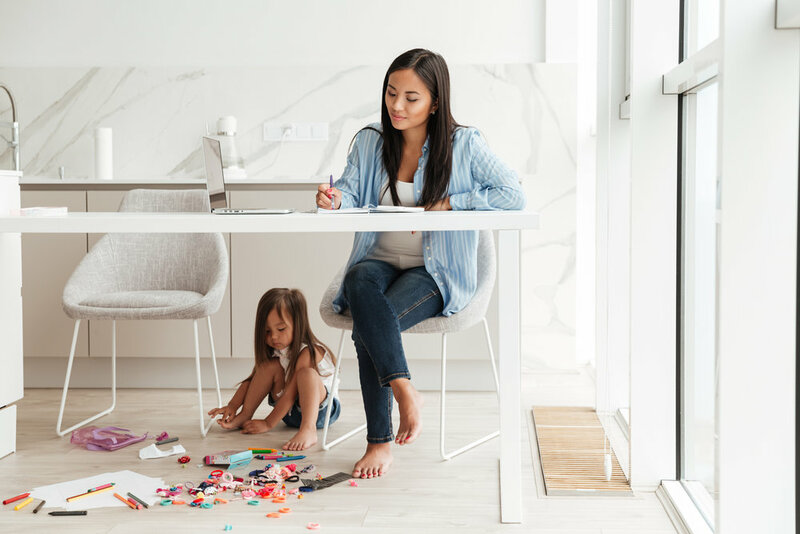 The boundaries between our professional and personal lives have been blurred for decades – something I believe to be especially true for working mothers. Don’t get me wrong, this isn’t a man-bashing blog, I love my husband and I wouldn’t be where I am today without his constant support. But, numbers don’t lie. A study released by the ABS in September last year revealed that across every age group, Australian men have more leisure time, on average per day, than women. In fact the average adult male in Australia has 34 minutes more leisure time than the average female… that comes to four hours every week. Can you even begin to imagine what you’d do with that four hours? It wouldn’t be the ironing, cleaning and lunch box prep that’s for sure. Maybe something like yoga or meditation would be on the cards – a necessary choice since the report goes on to state that women feel more stressed and pressed for time than men in Australia, with 35% of Australian men and 42% of Australian women stating that they were always, or often, rushed. And women are almost five times more like than men to feel this way due to, you guessed it, the demands of family. That’s something I’ve written about before so it should come as no surprise when I say, being a working parent is hard. The guilt is strong – guilty that I can’t always be there for my boys, guilty that there are times I can’t fully commit to my work and while I do my best to let go of my worry and try to ‘roll with it’, it’s so much easier said than done. But perspective is everything and I suggest we change ours today. Because right now there’s a new kid on the block – work-life integration. We’ve already said, the boundaries between our professional and personal lives are constantly blurred. Never before has this been more the case thanks to the many technological advances that have made work (and work objectives) impossible to be completed in a neat 24-hour cycle. Smartphones, email, video-chat and other such innovations have made it possible to work without having a typical 9-5 day and I, for one, welcome it with open arms. And so does Jae Ellard, a mindful awareness author and teacher and founder of Simple Intentions, a conscious content company that arms employees at multinational corporations with the tools they need to learn, practice and master the skill of awareness. So, let’s embrace the blending of our worlds as we search for a greater quality of life. I can go to my son’s school play because I’m able to check emails during intermission. Our whole family can go for a bike ride on Friday afternoon because my day started at 7am with a national conference call. I can do these things and more thanks to technology and my ability to plan the week around both my personal and professional time. If your work needs you to be available in the evening, make sure you schedule some family time during the day. Weekend business travel on the cards? Book in a catch-up with friends the Monday you get back and stick to it. This is where balance and integration intertwine to create counter-balance. And while I’m not going to pretend this is the answer to our longstanding search for the holy grail (after all, the clothes aren’t going to hang themselves out), it’s a big step in the right direction. Remember, your babies won’t remember what you packed them for lunch and the way you ironed their clothes… but they will remember seeing your face in the crowd at their weekend soccer games / dance recitals / graduations and beyond. And thanks to work-life integration, that’s something we can all strive to do.